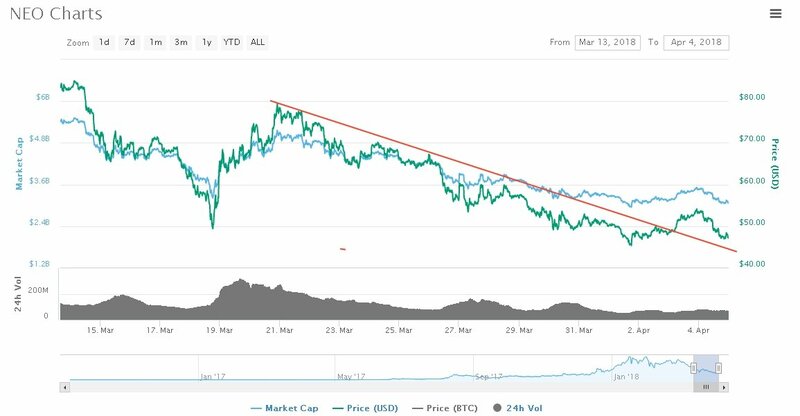 April is certainly a very event-packed month for the formerly known as Antshares or community called The Chinese Ethereum: NEO, with the most concentration dropping on the extended tour to take place in Europe. But, the beginning of the fourth month was the same as February and March with bears having their say throughout the market in general with no exception. The weekly declining trend line has been cleared out on April 2nd, but its going to be tested in the upcoming day so recommended to stay on the lookout for the $45.00 mark if it holds ground for the value not to drop lower. Source: coinmarketcap. The official monthly development report was released by the NEO council in which very highlighted was the Development Competition that was run in conjunction with Microsoft. In the data of the report it is noted out that around 500 projects were showcased, from which 50 were cleared at first check. There were also updates on the KPN and City of Zion consensus nodes. They were said to have run the testnet uninterrupted for two months. According to the stated report, the upgraded version of NEO-CLI has been released which will have its business with a P2P bug which impacted on slowing block times. This involved v2.7.3 and v2.7.4 of the CLI. However, with request by many exchanges, the council states that the release of the v2.7.1 was skipped because of the above mentioned purpose. During the first-ever NEO Hackathon, the NEOspace project claimed first prize. The NEOspace project was a Smart Contract aimed at leasing office space to users but based on how much time one needed the space. NEO never stops its steps and neither do we. As it looks like, April will be as exciting as February and March was for NEO. During these months, NEO hosted 28 events that were meet-ups and workshops all around the Asia-Pacific part of the globe. NEO is embarking on an extensive tour of Europe after completing a highly successful one of the APAC. The Amsterdam event, dubbed the biggest in Europe, will kick off on 14th of April. The event will be hosted by the NEO Council at DelaMar Theater. During the NEO Amsterdam Summit, more than 10 presentations will be taking place, including projects based on the NEO Ecosystem like VDT.Network and Ontology. The continent will be traversed by the tour with Lisbon coming right after Amsterdan on April 16. Afterwards: Madrid, Paris, Vienna and Zurich. Accordingly during the Event-Month, highlights like NEO XQRC Hackathon will be held on 13th April in Tokyo and a listing on the Cobinhood on 30th April of the NEO Token. For starters – NEO is attempting to create an infrastructure for a smart economy which targets making ownership of non-digital assets more verifiable, connected in general and more transparent. -Digitizing, “real-world assets… enabling registration, depository, transfer, trading, clearing and settlement via a peer-to-peer network.” – based on the whitepaper. Which means that the ownership of assets like vehicles, houses or any physical possessions willo be recorded on the blockchain in which case the ownership is given the opportunity to be connected to digital identities through smart contracts. Smart contracts – self executable contracts based on the blockchain platform that go live only specific conditions are met.